Results: The grant for 12 STGP satellite tags was leveraged to expand the project scope to 23 loggerheads. All 23 females were tracked for the entirety of the nesting season and to a final or near final home range. Nine tags remained transmitting as of 5/13/11. Three remigrant turtles were tracked for a second history to evaluate fidelity to the foraging ground and all three females returned to the same foraging grounds. Ancillary information gleaned from these tracked turtles builds upon and extends the contributions made by related or previous projects (STGP 06-021R, 07-024R, 08-019R, 09- 001R) on site fidelity, reproductive capacity, and stable isotopes. The 2010 tracking was also able to highlight potential impacts of petroleum spills on turtles in the Gulf of Mexico during the BP oil spill. Conservation concerns were identified for turtle migrations that crossed international boundaries to foraging grounds in Mexico (4), the Bahamas (4), Cuba (2), and Jamaica (1). Foraging grounds identified within US national boundaries included Florida Keys (3), Everglades (1), Tampa Bay (1), Charlotte Harbor (1), open water between Everglades and Keys (3), coastal neritic residency (2), and pelagic residency (3). The category of pelagic residency upon the West Florida shelf documented that 13% (3/23) of the 2010 tracked cohort occupied a zone of habitat overlap with the bottom long-line fishery. 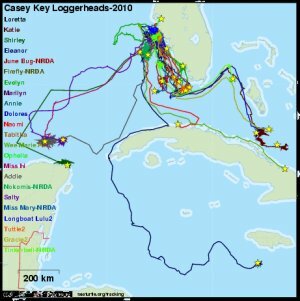 These cumulative results (2005-2010) reinforce that 21% (18/86) of tracked Casey Key loggerheads enter fishing zones of concern for the Gulf bottom long-line fishery.